Cheap game PC upgrade for my son. With kids growing up their PC performance needs change rapidly. My son has a small PC that served him well for a couple of years. It had a Celeron (1610) processor, a MSI B73MA-E33 mini-ITX motherboard, 4Gb of DDR3 RAM and a 1 TB HD which fits nicely in a LC Power computer case (1400mi). The operating system was Linux Mint 16. 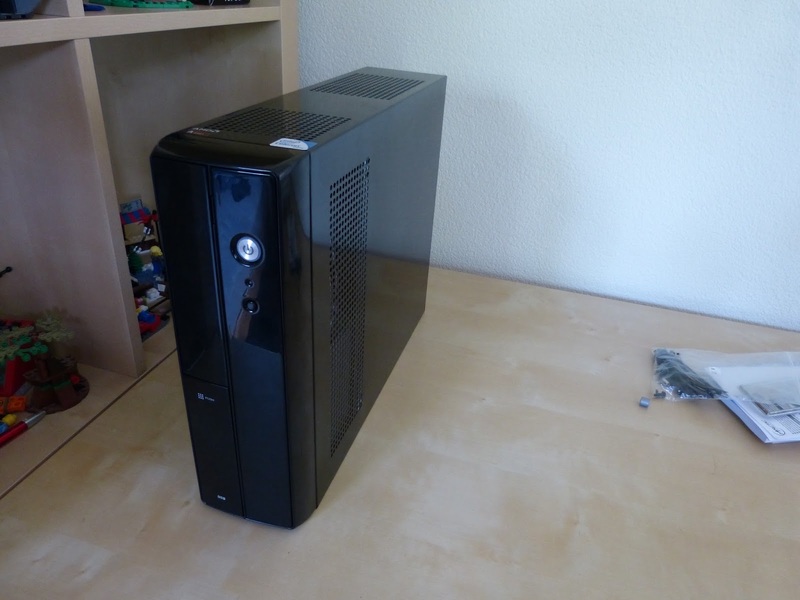 The case didn't allow an decent additional graphics card because of its limited height. The total sum of all components was $220 at the time which even by today's standards cheap. The PC booted fast, was quiet and cool and could even run some modest games like Minecraft and simple 2D games. 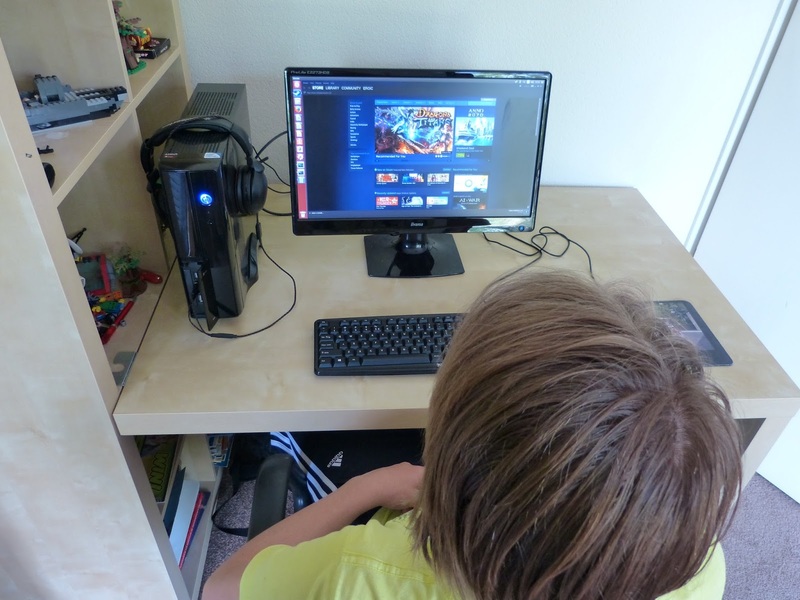 But now my son wanted to move to more advanced 3D games like Team Fortress and DOTA 2. These games simply cannot be played on the Celeron. For his new PC we wanted maximum (game) performance for a minimal amount of money (about $200). 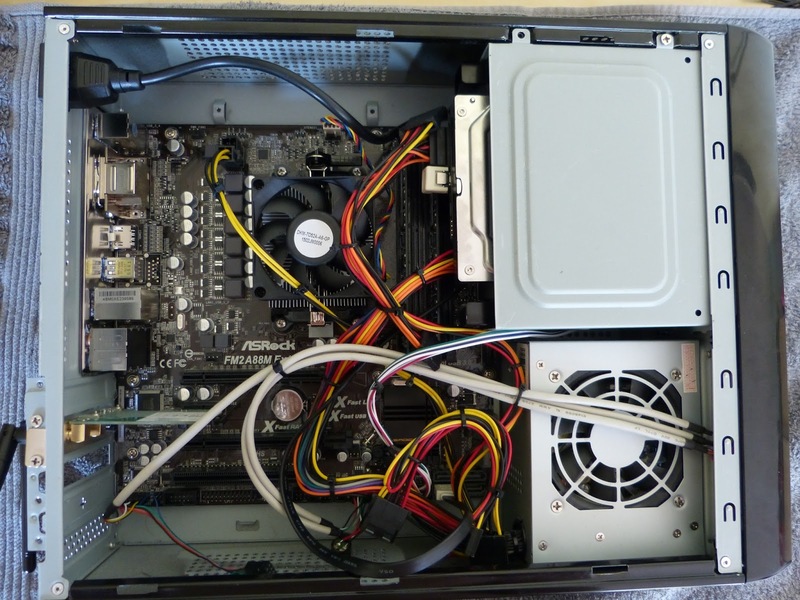 To reach this goal we had to use the LC Power case, the 1 TB HD and the 4Gb DDR3 RAM. My son wanted a AMD A10 processor because of the on-board graphics capabilities (8 GPU cores). But the LC Power case has a modest 200W power supply so he chose the AMD A10-7800 which has a TDP of only 65W. Additionally he choose a ASRock FM22A88M Extreme4+ microATX board. The LC Power 1400mi, a cheap computer case with 200W power supply built-in. It even looks nice. The ASRock board fits in the case but everything is so cramped that there is hardly any room left for the cables. One look at the image below of the inside of the case shows that this is not my finest hour in PC builds but it works. Getting the software to work was a bigger problem. Linus Mint that was already on the HD could only be started in recovery mode. After a couple of tries I gave up and installed a fresh version of Ubuntu 14.04LTS (which is somewhat similar to Linux Mint). This worked perfectly. It appears that all hardware is supported by Ubuntu and the OS is very zippy. Inside of the LC Power. The microATX fits but there is hardly any room for cable management. For just below $200 we have upgrade a PC with office like specs to a game PC. It is not a speed monster but hopefully we can squeeze just enough performance to serve my sons needs. The next couple of days were going to test games on the PC. Hopefully we get some adequate frame rates. My son behind his PC running Steam on Ubuntu. He's quiet happy with the speed of the system right now.